Tom Perriello has an anti-abortion, pro-gun voting record and wants to be Virginia governor. Tom Perriello Wants to Be a Progressive Candidate. Can He Overcome His Anti-Abortion, Pro-Gun Record? 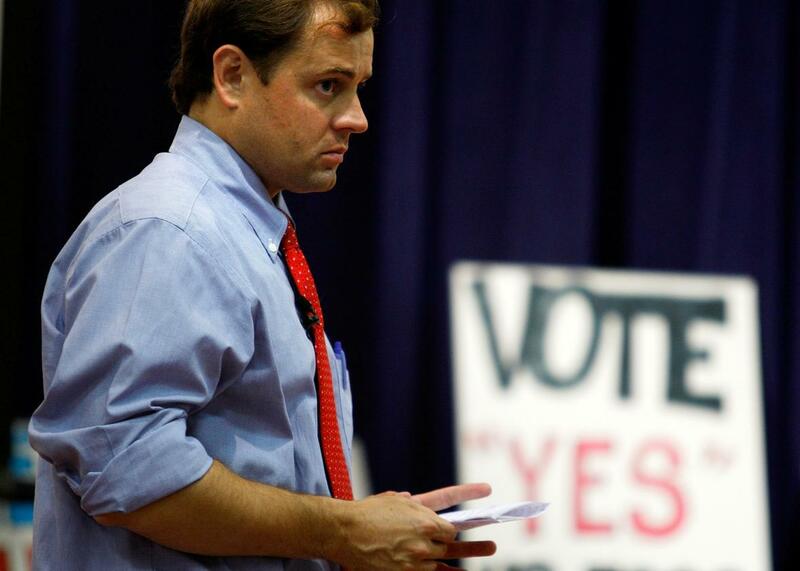 Tom Perriello at a town hall meeting oat Fluvanna Middle School in Fork Union, Virginia, on Aug. 17, 2009. Progressives greeted Tom Perriello’s recent entrance into the Virginia governor’s race with something akin to ecstasy. Perriello is a close ally of the president’s who won a single term in a fairly conservative Virginia district in 2008 and embraced Barack Obama’s legislative agenda during his short time in the House. A Yale Law School graduate and former human rights attorney, Perriello is being pitched as a liberal challenger to the purported centrist Democrat Lt. Gov. Ralph S. Northam, who had hoped to replace the term-limited Gov. Terry McAuliffe without a primary challenge. But this narrative isn’t quite right. Northam may have crafted a moderate image, but in reality he is a fierce advocate for liberal causes who hews closely to the Democratic platform. And Perriello, for all his progressive bona fides, has a voting record that clashes with the party’s current support for gun safety measures and, more importantly, reproductive rights. Northam, an Army major, ran for lieutenant governor—a position elected separately from the governor in Virginia—on a platform of common-sense gun control. Either way, Perriello’s anti-abortion record will be harder to explain. In 2009, Perriello voted for the odious Stupak amendment, a dramatic extension of the infamous Hyde amendment. The Stupak amendment would’ve prohibited insurance companies that participate in the Affordable Care Act’s exchanges from covering abortion. Its stated purpose was to prevent federal subsidies from paying for abortion, since insurance plans on the exchanges are subsidized for most customers. But the amendment was phrased so broadly that it would’ve forced insurance companies on the exchanges to drop abortion coverage for all woman. The upshot of the Stupak amendment was that women with plans that covered abortion would see that coverage dropped. An analysis by the George Washington University Medical Center Department of Health Policy also found that the amendment would restrict insurance companies’ ability to offer supplemental abortion coverage. Moreover, the amendment would’ve hampered liberal states’ ability to offer abortion services using state and local funds. The analysis concluded that the Stupak amendment was so sweeping that it could bar insurance companies from covering procedures linked to abortion, however tenuously. For instance, an insurer might feel compelled to refuse coverage for surgery to repair a damaged pelvis following a car accident if the procedure necessarily involved abortion. Obviously, Perriello’s anti-abortion vote does not disqualify him from Virginia’s Democratic gubernatorial primary. It does, however, call into question the lazy narrative that Perriello represents a progressive challenge to Northam’s centrist disposition. Northam is a liberal with a strong track record on gun safety and reproductive health, two core tenets of the contemporary Democratic Party. Perriello’s voting record suggests he is a blue dog Democrat who deviates sharply from the party line on gun control and abortion rights. If the Perriello of 2017 wants to run as a proud progressive, that’s his prerogative. But he owes it to voters to explain why he deserves to be seen as a liberal champion for Virginia.